Anton Bruckner way already forty years of age when the premiere of his D minor Mass at the Cathedral of Linz in 1864 marked his rise to a fame which would grow further. Taking two years for each, Bruckner composed other masses, the second in E minor of 1866 and then the third in F minor, which was commissioned by the Imperial court following a successful performance of the D minor Mass at the chapel of the Hofburg in Vienna on February 10, 1867. Bruckner began work on the F minor Mass on September 14 (against the advice of doctors treating his emotional disturbance) and completed it on September 9, 1868. Important events in Bruckner's life coincided with its composition. His beloved teacher Simon Sechter died on September 10, 1867. For all his grief, Bruckner had the presence of mind to apply for the position at the Imperial court that had fallen vacant at Sechter's death. He was appointed professor for organ, thoroughbass and counterpoint at the Vienna Conservatory as of October 1, 1868, and during that same September for the post of organist at the Imperial chapel. These events finally made his move from Linz to Vienna necessary. As choirmaster of the Vienna choral society "Frohsinn", he conducted the concert premiere of the closing scene of "Meistersinger" on April 4, 1868 and attended the premiere of the opera at the Hoftheater in Munich on June 21. In between all this he premiered his First Symphony in Linz on May 9. For Bruckner things were moving slowly but steadily forward. Bruckner felt no further inclination to go on composing masses since his creative energies were increasingly directed toward symphonic writing, a field in which he found he could more meaningfully express his own view of the world in terms of absolute music. 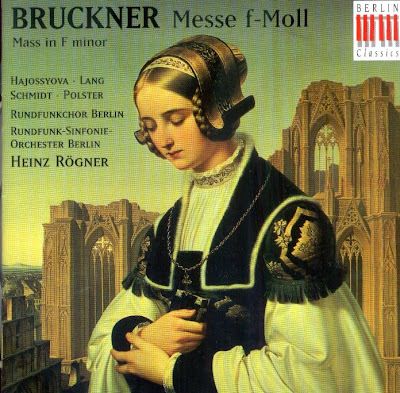 All three masses were radically revised by Bruckner in hte summer of 1876; the F minor Mass was also subjected to further corrections during a period stretching between at least 1890 and 1893 in preparation for its publication by Josef Eberle & Co. The succesful premiere under the baton of the composer on June 16, 1872 at the Augustinerkirche inVienna ensured at least half a dozen repeat performances in the ensuing twelve years, among which was the second performance at the Hofburg on December 3, 1873 - an event of particular importance for the composer - and the performance on April 27, 1879 at the garrison church of the fort of Ofen, which was one of the few early Bruckner performances during the 1870s to be given outside Linz and Vienna, where the composer was a known quantity. The F minor Mass follows the customary six-part structure necessitated by the liturgy. The Credo is however disproportionately lengthy, making it comparable with the thundering Te Deum of 1883, while the ensuing Sanctus lasts but two minutes. The CD was released by Berlin Classics, 1997, (DDD). Berlin Classics 0092472BC.